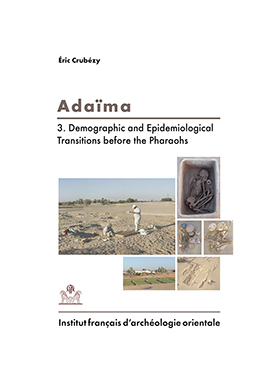 The Adaïma necropolis in the Nile Valley of Egypt has revealed more than 800 morphologically well preserved skeletons (adults, new-borns and children) dated from 3800 to 3000 BC. This makes it one of the most important prehistoric human samples in such a good state of conservation. It provides a unique opportunity to study the coevolution of man and diseases at this period. A synthesis of the study of funerary practices at this site takes into account the type of burial, whether these were primary or secondary burials, the occurrence of multiple burials, the existence of “human sacrifices” and differences in funerary practices between the different sectors of the cemetery. We propose a methodology to study funerary practices based on the three stages: to view, hide and sanctify. A paleodemographic study can apportion the role of the selection of subjects to be buried and the demography of ancient populations. These studies are then combined with a systematic survey of lesions in adults and children, whether infectious diseases, traumatic injuries, growth disorders, osteoarthritis and enthesopathies, DISH, rheumatologic diseases (spondyloarthritis), oral pathology, non-specific lesions (cribra orbitalia, endocranial lesion, periostitis, Harris lines), and pathologies more difficult to study in the past such as dystocia childbirth, calcified lymph node and bladder stones. This allows us to derive the frequency of these diseases and lesions in the ecological context of the Nile Valley, and compare it with that of other prehistoric populations. In Adaïma, the mortality rate was particularly related to an increase in the number of children per family, and a tuberculosis epidemic. The natural history of tuberculosis at this period resembles that in populations with no prior exposure to the disease during the historical period. A study on dental discrete traits shows that several populations of different origins lived in the Valley at this period. Adaïma derived from one of these heretofore unknown populations.